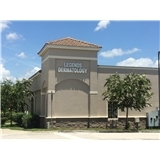 Legends Dermatology (Davenport) - Book Appointment Online! Our philosophy: We are committed to offering a compassionate and respectful care to all patients. The health of your skin is important to us. Skin cancers are a growing epidemic. I could not be more pleased with their service. Dr. Funieru and her staff were welcoming, efficient, and professional. They did a thorough exam, addressed the immediate needs, took tests, will be checking on my earlier test results from Michigan...and will follow up with me. They really care for the patient. I only wish I could take the whole team back to Michigan with me. Bunny B.